The Port of Rotterdam Authority is entering into a partnership with four start-ups for the development of as many innovative projects. Along with six other starters, these companies took part in the port-related accelerator programme PortXL and presented their results during yesterday’s ‘Shakedown’. The ten selected start-ups made amazing progress in the three month long PortXL programme. In fact, nine of them saw their efforts rewarded with a contract with organisations such as Van Oord, Vopak, Boskalis, Alliander and Stena Line. Starting in December 2014, IHC Sealing Solutions will operate under the new – but also old and trusted – name of Lagersmit. The new pay-off line ‘The Origin of Sealing Solutions’ pays tribute to the company’s rich history and its desire to supply the best sealing solutions, now and in the future. On 28 November 2014, the new name was unveiled at a party for the employees of the ‘new Lagersmit’. Why this new name and pay-off line? In the summer of 2014, the company became independent and consequently separated from Royal IHC. Upon completion of the expansion of the Panama Canal, the cost to transport grain from the U.S. corn belt to Asia will drop by an estimated 12%, thus increasing the cost competitiveness of the U.S. as a grain exporter to Asia, Rabobank forecasts. 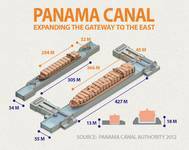 In a new report, “Panama Canal: Expanding the Gateway for U.S. Grain to the East,” Rabobank says the expansion of the Canal will accommodate grain-laden ships from the U.S. of 25% more capacity than before, resulting in a shift in U.S. grain shipping routes that doubles the draw area west of the Mississippi River for exports through the Panama Canal. A decision has been made to maintain the current shareholder structure at IHC Merwede. The IHC Merwede Supervisory Board – in addition to all of the current shareholders – is comfortable with the financial strength of the company for the next year. With the support of JP Morgan and Rabobank M&A, IHC Merwede has carried out extensive research over the past few months into the possibility of broadening the shareholding structure. However, the current situation within the global financial markets has resulted in limited opportunities to achieve this. IHC Merwede has recently increased its underwriting capacity by more than 50 percent to nearly $2.2 billion. Of this amount, over $1.3 billion has been committed. The financial agreement has been forged between IHC Merwede and an international banking consortium made up of five banks, with the aim of facilitating international growth. The five banks which form the consortium all have large international networks. Three of the five – ABN AMRO, ING and Rabobank – were chosen for their proximity to IHC Merwede’s Netherlands-based business.